Was Shakespeare Italian and born in Italy? In approximately 6 hours and 9 minutes both formats of my collection of 69 inter-related poems and short fictions Motion No. 69 will be available for purchase here. At the present moment only the e-book is available, somewhat ahead of schedule for a change. Rather like its author, this collection is slim, elegant, charming and darkly attractive. Motion No. 69 shows also that there is truth in advertising after all. A must read for a rainy day on the beach, whether it is a Blue Monday or not. The Garden of the Hesperides was Hera´s orchard, where either a single tree or a grove of immortality-giving golden apples grew. The apples were planted from the fruited branches that Gaia gave to Hera as a wedding gift when Hera accepted Zeus. The Hesperides were given the task of tending to the grove, but occasionally plucked from it themselves. Not trusting them, Hera also placed in the garden a never-sleeping, hundred-headed dragon named Ladon as an additional safeguard. However, in the mythology surrounding “the Judgement of Paris”, the goddess of Discord Eris managed to enter the garden and pluck a golden apple. 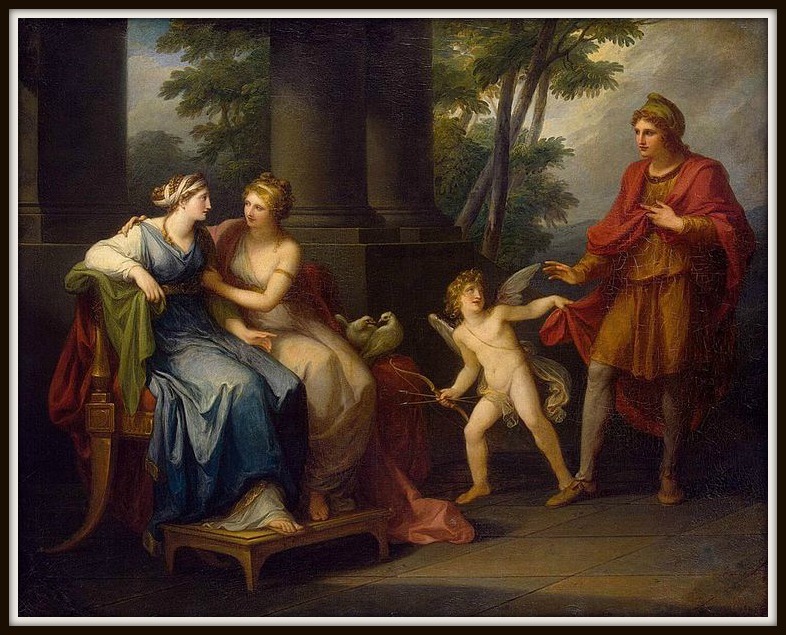 Eris had become disgruntled after she was excluded from the wedding of Peleus and Tetis (Achilles ‘ parents). The war originated from a quarrel between the goddesses Athena, Hera and Aphrodite after Eris, the goddess of strife and discord, gave them a golden apple, sometimes known as the Apple of Discord, marked “for the fairest” (Kallisti in greek). 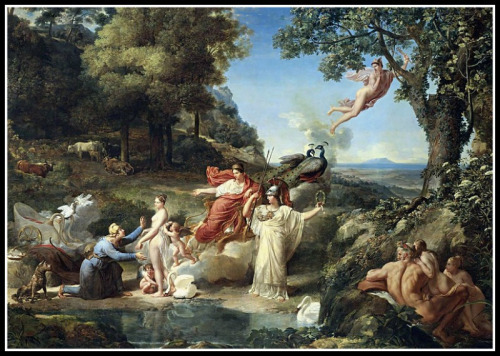 Zeus sent the goddesses to Paris, who judged that Aphrodite, as the “fairest”, should receive the apple. In exchange, Aphrodite made Helen, the most beautiful of all women and wife of Menelaus, fall in love with Prince Paris, who took her to Troy. Agamemnon, the king of Argos or Mycenae, was the husband of Clytemnestra and the father of Iphigenia, Electra, Orestes and Chrysotemis. Menelaus was Agamemnon’ s brother, and, besides, the king of Sparta. 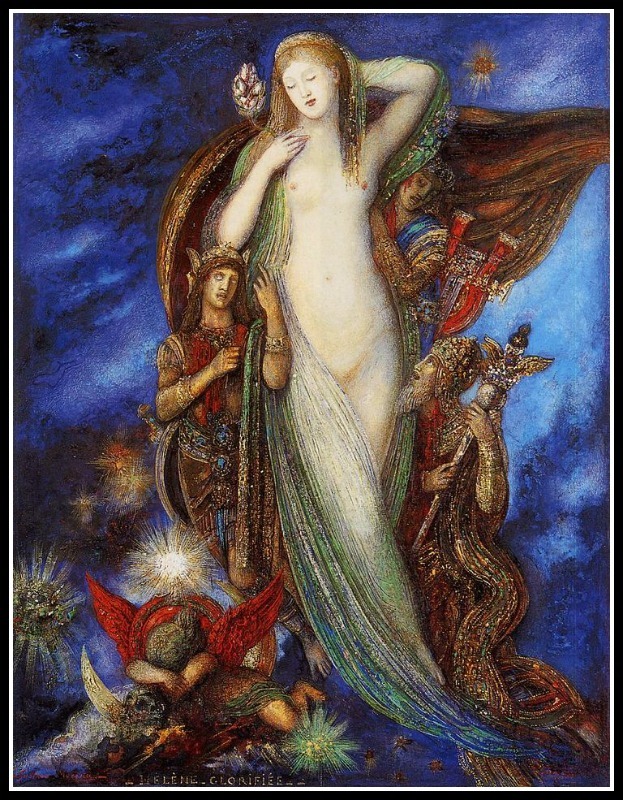 “Hélène glorifiée” by Gustave Moreau (1897). Helen of Troy, also known as Helen of Sparta, was the daughter of Zeus and Leda and sister of Clytemnestra, Castor and Pollux. Pollux shared a father with Helen (Zeus), whilst Castor’s and Clytemnestra’s father was he king of Sparta, Tyndareus. In Greek myths, Helen was considered the most beautiful woman in the world. By marriage she was Queen of Laconia, a province within Homeric Greece, the wife of King Menelaus, who was Agamemnon‘s brother. When it was time for Helen to marry, many princes came to seek her hand. During the contest, Castor and Pollux had a prominent role in dealing with the suitors, although the final decision was in the hands of King Tyndareus, Helen’s father. 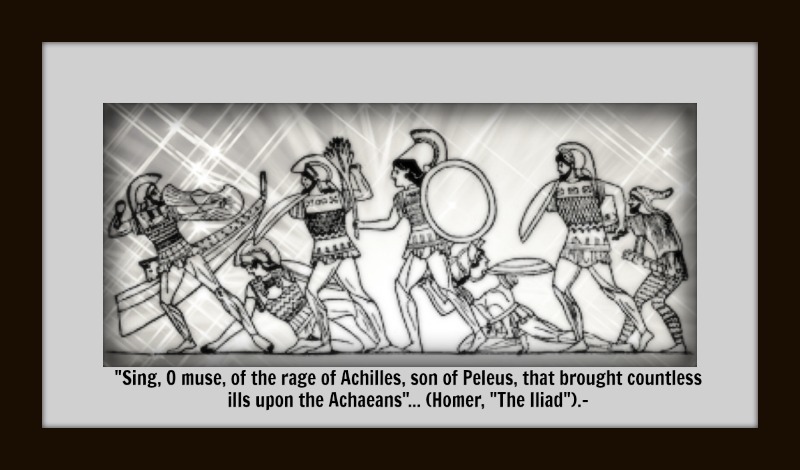 Menelaus, her future husband, did not attend but sent his brother, Agamemnon on his behalf.